Technically the 166 MM shared the tubular frame that was characteristic for all of the company's sportscars of the 1940s and 1950s. Suspension was equally straightforward with wishbones at the front and a live rear axle. The Gioacchino Colombo designed V12, now in its third iteration was just under two liters or 166 cc per cylinder. Ferrari outsourced production of the bodies to Touring of Milan who made 25 roadsters using their patented Superleggera technique. It fixed aluminum-alloy panels directly to a tubular space frame which was both light and rigid. Designed by Carrozzeria Touring’s head of design, Carlo Felice Bianchi Anderloni and bestowed by Giovanni Canestrini with the sobriquet "barchetta" or little boat, the car was an immediate sensation when it was first displayed at the 1948 Turin Auto Show. In fact Canestrini was stunned; Anderloni recalls, "he said, 'I'm stunned, for that is quite unsettling. That is not a car; it is absolutely new! That is a little boat--a barchetta! ", and thus the Ferrari legend was born. “Weight is the enemy and wind the obstacle” was how Anderloni summed up the firm’s philosophy. “Enzo Ferrari was a very clever man,” remembered Anderloni. “He recognized he needed a sophisticated, uniform appearance so that when a number of his cars lined up at races such as the Mille Miglia, people would recognize that they were Ferraris.” The Ferrari 166 MM would soldier on into 1953, and other coach builders, such as Vignale and Zagato, made bodies for the chassis. 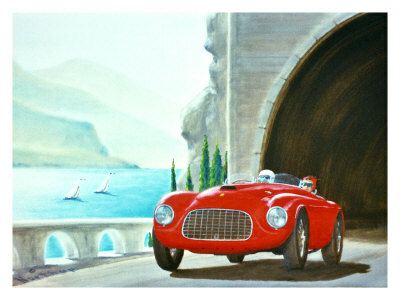 But it was the designs from Touring that were instrumental in giving Ferrari its first “face".